In 2013 everybody gave Blackberry a few months to live! After all, Blackberry was in deep trouble. The Playbook tablet was a huge failure (even if it was a nice tablet, especially with the Playbook 2.0 update), Blackberry 10 OS was delayed a little bit more, BB7 was outdated and losing a huge percentage of market share, and Windows Phone was pushing hard with the new WP 8 platform. With all these troubles in the hardware/software market we don’t have to forget that Blackberry was up for sale for a few months, and at the end - in a last weird move, they decided not to sell. All of this, to be honest, didn’t send positive vibes to potential customers. But we are in 2014 and in the difficult Smartphone market things change very fast. Look at Motorola: they went from 0 to 6% market share in the UK with the Motorola Moto G in just a few months (read my review here). So here are my 10 reasons why Blackberry is still a relevant brand and why BB10 OS is another option to seriously consider. It can be a physical or touchscreen keyboard, but the truth is that it is still a joy to use a Blackberry to write lengthy email, messages, edit docs etc… The word prediction that you find in Blackberry 10 OS is one of the best and definitely much better than the auto correct you can find on iOS7 or Android. If lags, apps crashing, and slowness irritates you, you will be pleased with the new Blackberry operative system: BB10.2. The OS is very intuitive and a joy to use. If you are serious about productivity you don’t need lags then Blackberry 10 OS can be an excellent choice. One of the core businesses of Blackberry is security. Since the launch of their first Smartphone (a long while ago), Blackberry has always been known for top security. It’s no wonder why so many Presidents and Prime Ministers around the world use a Blackberry Smartphone. As we know, more and more companies allow their teams to bring their own smartphones to work. It’s fine and works perfectly for small/medium companies. However, bigger and multi-national corporations need more security and to stay focussed on productivity. 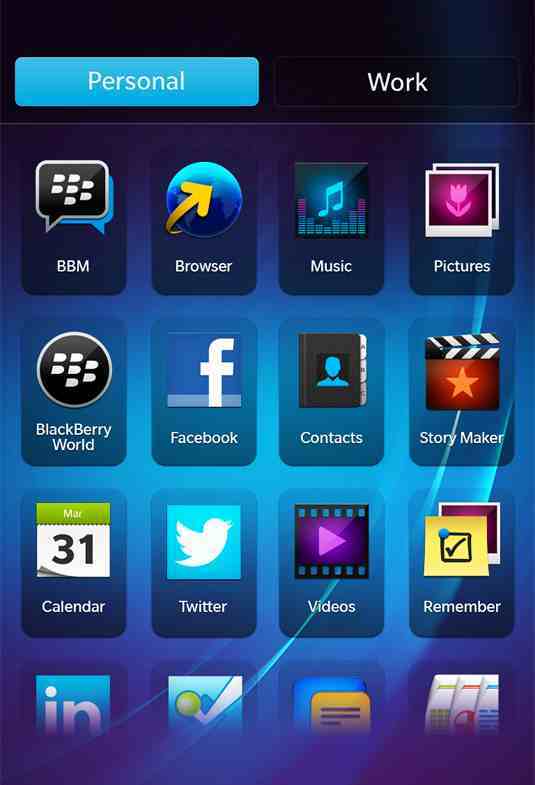 With Blackberry 10 OS, you can swap easily between Entreprise environment to Personal. Blackberry with the BB10 OS solves an important issue with this clever function. Unfortunately, the way the success of a platform is measured is with the number of apps available. More apps = more choices, which means that the chance for a Smartphone to be a hot seller is higher. True, but do we really need a thousand fart apps? Personally I don’t. The Blackberry app store is still far behind other App stores (such as Apple and Google Play), but the good news is with the latest Blackberry 10 OS update you can now install Android Apps. So technically you have access to millions of apps from Android. You can’t download them directly from Google Play but you can sideload them. The process is very easy and quick. Update: Amazon App Store is available with Blackberry 10.2!!! Blackberry was known for a poor browsing experience with their legacy system. Internet on a Blackberry Bold was painful (even if the latest BB7 update improved this aspect a lot). With the new operative system BB10, Blackberry has turned this problem around. In fact the Blackberry browser is now one of the fastest. Browsing the web on a Blackberry 10 OS device is a pure pleasure. If you can’t get an app for a certain service you can use the browser instead. 2013 has been a year to forget for Blackberry. As a result of poor sales and extremely bad press reports, the Blackberry Z10, Q10 and Z30 are heavily discounted. So the good news is that you can get a powerful Smartphone for 50-70% cheaper than an Android/iOS flagship device. 8. BBM is still popular. Do you remember BBM? That was one of the features that made Blackberry so popular. Free immediate messages with all your BBM contacts was cool. When everybody thought BBM was dying, Blackberry launched a new version of BBM for iOS and Android. Surprisingly BBM was one of the most downloaded apps in the Apple store and Google Play. Today BBM is back, and with a great BBM video function it has all the possibilities to come back on top! Blackberry has announced new devices for the end of 2014. And with the latest deal signed with Foxconn, it looks like Blackberry will be able to deliver faster, better and cheaper smartphones. Whatever we say, Blackberry is an iconic brand, which means that it has a special place in the heart and soul of millions of people. We all loved our Blackberry (before iPhone), we couldn’t wait for the red light to shine. But times have changed and I suppose Blackberry has gone down hill the day we changed the way we communicate. We don’t send as many emails as we used to, and secure email was the main business of Blackberry. New apps such as Whatsap, social network (Facebook, Twitter, G+) have completely changed the way we communicate with each other. But if Blackberry can reinvent itself with a great Smartphone in the same way Motorola did with the Moto G, I think future is bright. At the end of the day, can you imagine the smartphone world without Blackberry! Read my Blackberry Z30 Review: The best phone I ever owned. Click here.